After spending the last few weekends with DofE groups of varying levels of experience I began to notice some similarities with the teams. 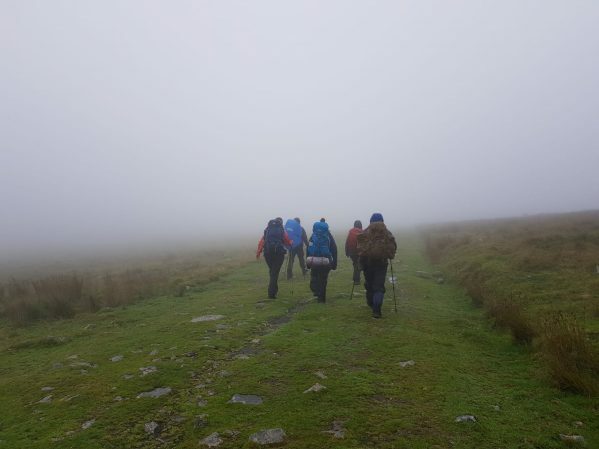 They all had different challenges to face: torrential rain, broken kit, errors with navigation, to name but a few. There seemed to be some elements that they all had in common that certainly helped. Familiarity with team members. Knowing when a song or a sweet was needed and also knowing when a few moments of being left alone was the best course of action. Familiar kit. Having a brand new rucksack and boots for instance, straight from the internet, proved a challenge. The team members that had already taken their kit out for a thorough testing had least issues on the expedition. Being organised. Getting into a wet tent knowing that it’s going to be still raining in the morning requires some good tent organisation. Also having the right kit in the right place in the rucksack is of benefit. It’s no use having the first aid kit and waterproofs right at the bottom and the Trangia and sleeping bag at the top. Having a cheerful nature. Being out for several days doing something that’s physically and mentally demanding can test the most cheerful of us, but the ability to remain happy is great for team morale. Being a good decision maker. That feeling of isolation that we’ve all had when everyone is relying on you to come up with a plan that will please everyone is tough. Being able to sound confident is half the battle. Willing to improve and learn from mistakes. This is a great skill to have on expedition. Single mindedly sticking to a plan or decision that is clearly not the right one will benefit no-one. Being a good communicator. Being able to communicate when the wind is whistling and the rain is lashing is essential, or maybe that’s just the ability to shout louder than the elements. Communicating effectively with other team members and the staff that are leading the trip is crucial for success. A good work ethic. When you are feeling that you have absolutely no energy and all you want to do is get back in the minibus is tough. Being able to overcome this and get the tent pitched, or the dinner cooked will lift everyone’s spirits. Being resilient. Showing that a few obstacles will not stop you from achieving your goal. Being able to sleep through heavy rain, wind, snoring, and anything else that a campsite can throw at you. Several hours sleep can make a huge difference to how you will feel in the morning. Sometimes it can make the difference between success and failure. It has been an absolute pleasure to walk and work with teams from my own school and another local school recently and see all of these qualities in abundance. Well done teams!